David Randolph "Dave" Scott (born June 6, 1932), (Col, USAF, Ret. ), is an American former NASA astronaut, retired U.S. Air Force officer and former test pilot. He belonged to the third group of NASA astronauts, selected in October 1963. As an astronaut, Scott became the seventh person to walk on the Moon. As an astronaut, Scott made his first flight into space as pilot of the Gemini 8 mission, along with Neil Armstrong, in March 1966, spending just under eleven hours in low Earth orbit. 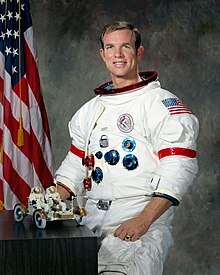 Scott then spent ten days in orbit as Command Module Pilot aboard Apollo 9, his second spaceflight, along with Commander James McDivitt and Lunar Module Pilot Rusty Schweickart. During this mission, Scott became the last American to fly solo in Earth orbit (not counting subsequent untethered EVAs). Scott made his third and final flight into space as commander of the Apollo 15 mission, the fourth human lunar landing, becoming the seventh person to walk on the Moon and the first person to drive on the Moon. ↑ Joachim Becker. "David Scott - EVA experience". ↑ 3.0 3.1 "Biographies of Other Apollo Astronauts". NASA. Retrieved 29 June 2016. This page was last changed on 23 May 2017, at 00:28.